Herefordshire Lore collects, publishes and archives people’s recollections. We’re a voluntary group and we’ve been collecting and publishing people’s memories since 1989. Herefordshire Lore was started by writer Bill Laws and story-teller Lenny Alsop with support from two Herefordshire arts officers, Veronica Jamset and Natalia Silver. Since then over 150 people have been recorded – and half a million words of reminiscence stored for posterity at Herefordshire Records Office. In projects like ‘River Voices’, ‘Weeping Poppies’, ‘Home Made – Home Grown’ and ‘Butchers, Bakers, Cider Makers’ we interview ordinary, working people: munitioneers, housewives, farmers, railway men, domestics, butchers, shop keepers, publicans, cattle dealers, auctioneers. 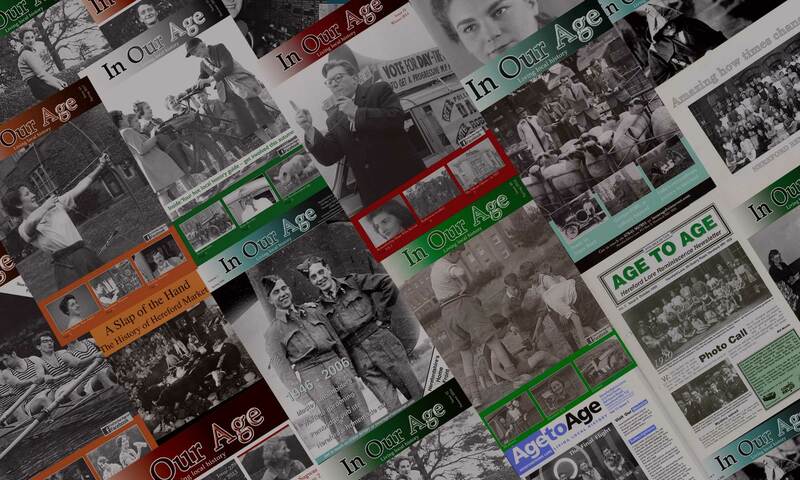 We’ve talked to over 50 local groups, published books, booklets and a decade of Age to Age before launching In Our Age. When we find funding, our team records people, one-to-one, transcribes the recording, and lodges the master copies with Herefordshire Archive Service. Projects are monitored by a group of older people. We work closely with the Museums and Libraries Service, and groups like Age Concern. We rely on grants, subscriptions, donations and advertising and on our volunteers. In Our Age costs over £6,000 a year. It’s free, because we want everyone to read it.